THOUGH I HAVE zero medical training, I feel qualified to tinker with one of the most timeworn adages about health. Having lived in Paris for 27 years, I've concluded that a croissant a day keeps the doctor away. At the very least, it's the best way to start the day. A croissant safari is also a delicious way to explore Paris—especially now. In a welcome rebuff to the many bakeries that use industrially made dough, a new generation of pastry chefs committed to top-quality ingredients and traditional methods is leading a renaissance of the emblematic indulgence. Sampling their wares will also not only get you out of bed early (croissants tend to be best in the morning, when they're freshly baked), but take you to parts of the French capital you probably wouldn't see otherwise. Some of today's best croissants are made in lovely neighborhoods where Parisians actually live, as opposed to the well-trod precincts around major museums and monuments. The first thing I learned about one of the most quintessentially French of foods, by the way, was that they weren't originally French at all. Austrian-born Marie Antoinette is said to have introduced thekipferl, a crescent-shaped Viennese pastry, in the 18th century after she arrived to marry King Louis XVI. Another story attributes the croissant's French debut to Austrian baker August Zang, who opened a shop in Paris in the 1830s. What is certain is that local bakers refined the pastry by making it with a yeast-leavened dough that's layered and folded several times with chilled butter, a process known as laminating. 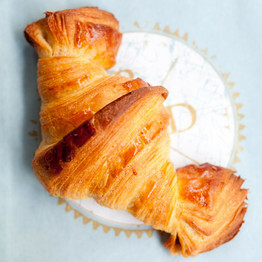 This labor-intensive routine is what gives the croissant its flaky quality, and part of what made the pastry so popular. My own croissant connoisseurship began under the tutelage of Maria, the Spanish concierge in the elegant Seventh Arrondissement building where I lived when I moved to Paris in 1986. I was an unlikely tenant; everyone else in the building was in bed by 9 p.m., and many of my genteel neighbors walked with canes. Every morning, Maria tied a black scarf over her head, went to early mass, then bought a morning baguette and croissants for my landlord, a retired British diplomat, and his French wife. One morning Maria surprised me in my pajamas when she knocked on the door with my mail (she usually slid it under the doormat). When I peered around the heavy oak door, she handed me the post and a white paper bag. "Feliz cumpleaños, Señor," she said with a slight bow. Since she knew it was my birthday, I guessed she'd been paying keen attention to my mail, but any uneasiness vanished when I tucked into the best croissant I'd eaten in my life, a lightly buttery pastry turban with a crust that flaked apart in golden, rectangular crumbs and hid a delicate, cottony interior. That afternoon, when I stopped by to thank her with a bunch of rust-colored chrysanthemums, she crossed herself before taking the bouquet—unbeknownst to me, in France the flowers are seen as appropriate only for cemeteries—but we became friendly. I asked her where to find the best pastries in the neighborhood; that night I found a tidy hand-written treatise pushed under my door. Maria bought her croissants at La Maison Pradier during the winter and Gosselin in summer, because, she explained, the latter's fours (ovens) were newer and therefore hotter when it was humid, which meant better crusting. Her favorite shop, though, was Gérard Mulot in Saint-Germain-des-Prés, often the destination of her midday walk. "You should know from the smell that a croissant was made with good unsalted butter, but it should not be the dominant taste," she wrote. "They should be a nice golden color, but not too dark, which means they've cooked too long and could be dry." I became an eager student of croissants. The key to spectacular examples is the dough, bien sur. 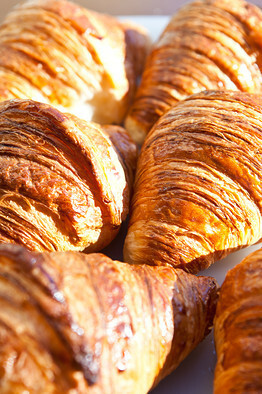 "It takes 48 hours to make good croissant dough," said Fabrice Le Bourdat of Blé Sucré bakery in the 12th Arrondisement. "First you make the dough and let it rest for a day chilled. The following day you add the butter and do thefeuilletage [laminating]. Then you spread and stretch it, roll it again, and let it rest so that it rises slowly. It's a very time-consuming process involving a lot of manual labor, and this is why so many Paris bakeries now buy their croissant dough ready-made." Many, but not all. I recently embarked on a week-long tour des fours with a baker friend who was visiting from abroad. On our expedition, I learned how important the raw ingredients—butter, flour, milk, sugar and yeast—are to a great croissant. The new generation of bakers painstakingly sources minimally processed, often organic, components for dough. (Mr. Le Bourdat, for example, said he uses organic yeast, because "it contains no extraneous chemical agents and produces a slower fermentation, which allows the flavors to develop more fully.") I was also reminded of why Paris is the only city where I don't mind hearing the alarm clock go off. 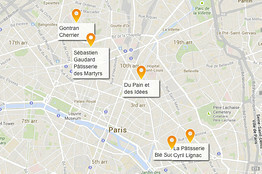 Sébastien Gaudard Pâtisserie des Martyrs is a bakery in Paris. An earlier version of this article called it La Pâtisserie des Martyrs.